Hi there! 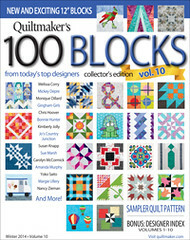 Can you believe there's been 10 issues of Quiltmaker's 100 Blocks magazine! It's very exciting, that' s ONE THOUSAND blocks. And while I missed a chance to get in on the blog hop, I didn't want a miss a chance to share it with you! Do you know I've had a block in all 10 issues!! 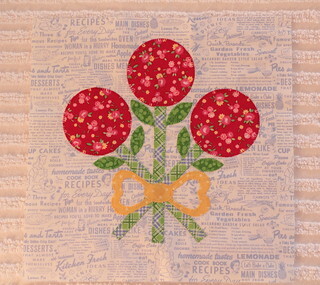 Here's my block for Volume 10, it's called Flower Pops, inspired by cake pops that you see all over the place! There are plenty of chances to win a copy of the magazine, so head over to the Quilty Pleasures Blog and check out the designers on the blog hop. Before you head out though, here's the super fun video I linked to last week. Ok, have a great day Super Friends! I've watched the video a few times since it has come out. Love all the expressions!! Congratulations on having a block in EACH of the 10 issues. That calls for a celebration Pam!! Hi Pam! Love your block and your part in the video -- you are a woman of many talents! :-). Congrats on being in every issue! Have a great day! Again such a sweet block! And congratulations! CUTE Blocks, every one! I loved seeing you on the Video. I waved!!! Thanks for a makign a block for all the Volumes! Congratulations on being in all 10 issues! The video was fun. Of course you're perfectly accesorized!